Recently, a bill passed in the Illinois House of Representatives that will require schools across the state to modify hard school disciple practices. Senate Bill 100, which was approved last month in the Senate with bipartisan support, addresses the “school-to-prison pipeline,” and received a “yes” vote from the House last week. 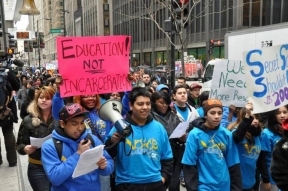 SB 100 was led by VOYCE, a youth-led coalition consisting of various community groups through the city, and supported by the Campaign for Common Sense Discipline, to provide at-risk students with academic and behavioral support and promote fairness by holding public schools and charter schools to the same standards for school discipline. The final House vote was 73 yes and 41 no. SB now awaits Governor Rauner’s signature. “In schools all across our state, African-American students are disciplined more harshly than white students. As legislators, we saw that this was a serious problem–and that it required our immediate attention. We went to work engaging educators, administrators, parents, students and experts to help us build support for SB 100. Through that process and hard work, we have passed SB 100, a common sense solution to ending this disparity and making our schools safer and stronger. Thanks to SB 100, Illinois is a national leader with a model piece of legislation,” said Senator Kimberly Lightford, chief sponsor of SB 100. Research shows that overly harsh discipline practices are particularly harmful to students of color and do not promote school safety or academic achievement. Last year, the U.S. Departments of Education and Justice issued joint guidelines on school discipline practices and warned against the discriminatory use of “zero-tolerance” policies on students of color and those with disabilities.